Politics / News City Council to Mayor Rahm: I'm your puppet! One of my favorite songs from the 1960s is "I'm Your Puppet," by James & Bobby Purify, the great soul-singing duo of cousins from Florida. It's the one that goes, "Pull the string and I'll wink at you, I'm your puppet . . ."
And then it goes, "I'll do funny things, if you want me to, I'm your puppet . . ."
Man, I could sing that song all day. James & Bobby were, of course, singing about some beautiful woman who controlled their heartstrings. But they just might as well have been singing about all those aldermen who dance at the end of Mayor Emanuel's string. You know, like the song says, "Snap your fingers and I'll turn you some flips, I'm your puppet . . ."
Just consider this exercise in puppetry from Monday's budget committee hearing over the issue of hiring more police. As you probably know, a lot of residents have been demanding more police if only to keep up with attrition caused by retirements. The progressive caucus—that is, the eight aldermen who don't dangle from the mayor's string—proposed that the mayor hire 250 more police. Hold it—I feel another great lyric coming on: "Your every wish is my command—all you got to do is wiggle your little hand . . ."
The progressive aldermen suggested that the mayor could find the money to hire more police by cutting down on the amount of police overtime he has budgeted. Apparently the mayor has decided that the most effective way to fight crime is the work-them-like-a-dog model most commonly used in factories in Bangladesh. In any event, Aldermen Rick Munoz and Scott Waguespack introduced the proposal to hire more cops at Monday's hearing of the budget committee, whose primary purpose, as near I can tell, is to rubber-stamp the mayor's budget. Or as the Purify cousins might put it: "Pull them little strings and I'll kiss your lips, I'm your puppet . . ."
Anyway, let Alderman Waguespack tell you what comes next. "[Committee chairwoman] Alderman Carrie Austin called for a motion. And Alderman Michael Chandler made a motion to pass our amendment. In other words, he made a mistake—from the mayor's viewpoint. He should have made a motion to table our amendment. Someone seconded the motion and it came up for a vote. And everyone started to vote aye. Next thing you know, our motion passed!" Uh-oh, the mayor's not going to be happy. "The mayor's staff was freaking out. 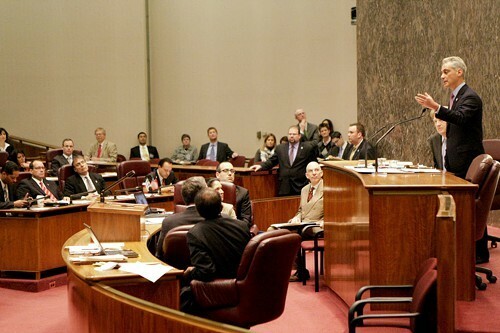 They're talking to Alderman [James] Balcer, who goes, 'Ugh, chairman, table.' And Alderman Austin goes, 'What?' And we've got Maria Guerra [Emanuel's City Council liaison] yelling out, 'Chairman's discretion.' And I'm yelling back, 'This is our body. We don't need help from the peanut gallery.'" Following Guerra's instructions, Balcer moved to table the amendment the committee had just passed. And the same aldermen who had just voted to hire more police turned right around and voted not to hire them. C'mon, Aldermen Balcer and Austin—take a solo . . .
"I'll be wonderful, do just what I'm told—I'm your puppet . . ."
It's funny how things work in the City Council. When the independents make a little mistake—as they did in last year's elected school board matter—they get lectures about the importance of dotting every i and crossing every t.
'Cause that's how great democracies work! But when the mayor's crowd screws up—hey, man, that's why pencils have erasers. While we're on the subject, let's have a line dance from Aldermen Joe Moore and Ameya Pawar, who can always be counted on to lecture the progressives on the art of passing legislation. "I'm just a toy, just a funny boy, that makes you laugh when you're blue—I'm your puppet . . ."
In defense of the mayor's aldermanic backers—in their heart of hearts, they probably want to hire more cops. But you know how it goes: when the man says jump, the only question is how high? Or as the Purify cousins might put it: "I'm your walking, talking, kissing, loving puppet . . ."
Enjoy the song, Chicago. Just remember—you elected them. But for aldermen, the appointments are a mixed blessing.